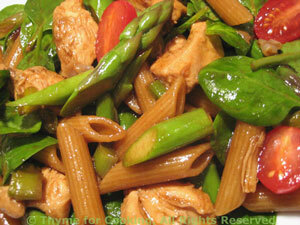 Warm Chicken, Asparagus Salad, Pasta, Thyme for Cooking spring salad. Another dish that straddles to genres - not quite a pasta; not quite a salad. But it's perfect for spring, featuring: asparagus, spinach, green garlic and cherry tomatoes. Cut chicken into bit-size pieces. In a medium bowl mix 2 tsp oil, soy sauce, cumin and paprika. Add chicken and stir well to combine. Set aside to marinate. Prepare spinach, wash and dry if needed. Trim asparagus and cut into 1 1/2" (4cm) lengths. Trim green garlic and slice, using most of the green tops. Heat remaining 2 tsp oil in a large nonstick skillet over medium-high heat. Add asparagus, green garlic and sauté until asparagus is crisp-tender, 5 - 7 minutes. Add chicken and all marinade to skillet and sauté, stirring, until cooked through. Reduce heat, return asparagus, green garlic to skillet and heat through. Add spinach, cherry tomatoes, pasta and vinegar to skillet. Remove from heat and toss to combine. Serve.